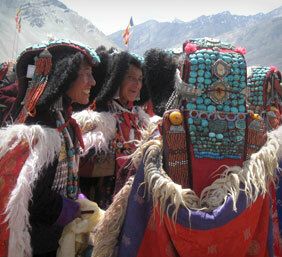 Inhabitants of Brokpa valley of Ladakh are regarded as pure Aryan race by modern scholars and historians of world. Some historian believed that they are descendents of the wandering troops of Alexander of Macedonia. They are known to Ladakhi by Brokpa. The physical features of Brokpas are different from rest of Ladakhi, they are tall, well built and fair complexioned, a few blond hair and blues eyes and their traditional dress is also very distinctive. Their traditions, culture and Language are fully different from the rest of the Ladakh which they have preserved since ages. Only influence they have got from the rest of Ladakh is their belief in Tibetan Buddhism, besides that they also follow some of their ancestral belief like Bonchos (Animistic). Brokpas are lover of songs and dance, they have a various folk songs and dance which throw light on their history, distinct culture and well preserved identity. Brokpas valley, have five villages, Hanu, Biama, Garkon and Darchig is situated west of Ladakh. It's 163 kms from Leh Town and can be reached passing through beautiful villages of Sham valley, Nimu, Basgo, Likir, Saspol, Alchi, Kaltse, Domkhar, Skurbuchan and Achinathang. Aryan valley can be explored along with Sham valley jeep safari and Sham valley trek.